Sauces, Baked Goods, Beverages, etc. A much bonier and fattier cut than the shin, pork hock is smaller but requires longer cooking than the shank. A hock generally requires 3-4 hours of slow, moist cooking, as opposed to 1-1/2 or 2 hours needed to roast a shank. But despite these differences, you can make a fair simulacrum of stinco di maiale al forno con patate with fresh pork hocks. This recipe will show you how. Stinco di maiale al forno con le patate is cold-weather comfort food in Italy, with a particular connection to Trentino-Alto Adige and other northeastern regions influenced by Austria and the cooking of Mitteleuropa. 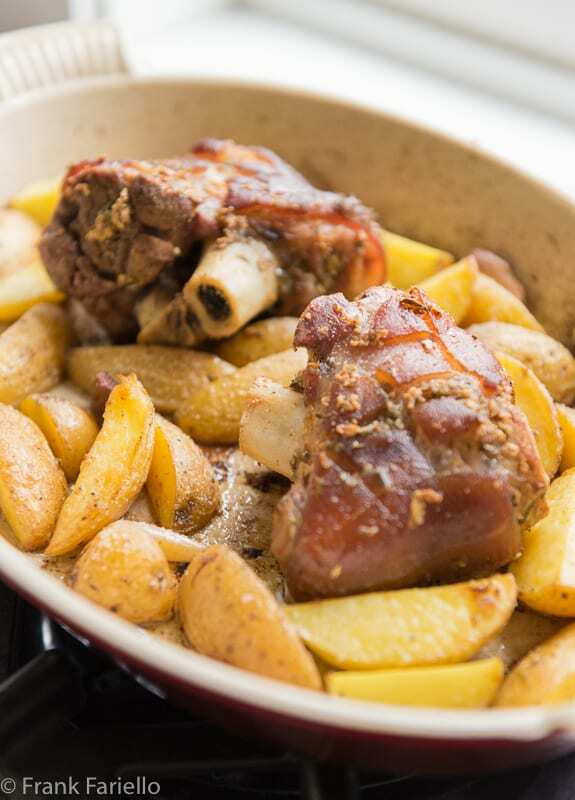 It is a simple dish of pork shin and potatoes, seasoned with rosemary, garlic, salt and pepper, then roasted together in the oven until both are tender and golden brown. In this adaptation, the fresh pork hock is first simmered with aromatic vegetables until half-cooked, then oven-roasted along with potatoes, as if it were a pork shank in the usual Italian manner. A pork hock may not be as meaty as a shank, but what it lacks in meat it makes up for in the wonderful flavor it lends to the potatoes. To start, simmer the pork hocks and aromatics in enough water to cover for about 1-1/2-2 hours. (You can reduce the time to 30-45 minutes in a pressure cooker.) Remove the hocks from their liquid on to a cutting board. Score the skins of your pork hocks in a crosshatch patterns with a sharp knife. Let them cool off and air-dry for a few minutes before proceeding. While the pork hocks are cooling, mince all the dry marinade ingredients together very finely, until you have a kind of paste. (A food processor makes short work of this, but for a finer result, chop the ingredients first with a knife and then grind everything together with a mortar and pestle.) Apply this paste all over the hocks, taking special care to make sure it gets into the crevices where you’ve scored the skin and on any exposed meat. If you have time, let the meat rest to let the marinade penetrate into the meat, as long as overnight—but even a hour will do. Grease the bottom of a large baking dish or roasting pan with olive oil, then put the hocks in. Roast them at 180C/350F for 45-60 minutes, basting with white wine (or some of the simmering liquid if you prefer) from time to time. While the hocks are roasting, in a large mixing bowl, dress the potato wedges with the olive oil, salt and pepper. Remove the hocks from the oven. Surround the hocks with the dressed potato wedges, then nestle the rosemary and garlic cloves among them. Put the pan back in the oven and continue roasting and basting for another 45-60 minutes, until the pork hocks and potato wedges are both tender and nicely golden brown on the outside. Let rest for a few minutes before serving. This is a rich, hearty dish that goes very well with a lightly dressed green salad on the side. You could precede your stinco di maiale al forno con patate with a pasta or risotto as a primo, but I would go for a light vellutata or other soup instead. You could even skip the first course entirely and substitute a light antipasto like a smoked salmon carpaccio. While stinco di maiale is usually sold skin-off in Italy, I wouldn’t recommend trying to skin a pork hock. A hock is fairly boney and has relatively little meat, so I reckon you need the skin to hold everything in place as it cooks. (And the roasted skin, for us hard-core pork fat lovers, is a real treat.) Scoring the skin is a compromise that lets the marinade penetrate better. In the US, pork hocks are also called “ham hocks” and especially when smoked, as they often are here. A fresh, unsmoked pork hock is what you want to approximate a stinco di maiale. Smoking would lend an extraneous flavor to the dish. And besides, a ham hock is best for moist cooking methods, simmered with collard greens, beans, split peas and such. I doubt it would be a good candidate for oven roasting. Allow one hock per person, no more. While pork hocks don’t have a great deal of meat, the skin and tendons—assuming you want to eat them, and you should—are quite filling. So are the potatoes, which will soak up those delicious pork drippings. Pork hocks are bulky, so this is not an easy dish to make for a crowd in a home oven. So, ususually, the measurements in today’s recipe is for only 2 people, though they can be easily scaled up. Don’t throw away the simmering liquid by the way. It makes a fine base for a lentil or bean soup. While the pork hocks are cooling, mince all the dry marinade ingredients together very finely, until you have a kind of paste. (A food processor makes short work of this, but for a finer result, chop the ingredients first with a knife and then grind everything together with a mortar and pestle.) Apply this paste all over the hocks, taking special care to make sure it gets into the crevices where you've scored the skin and on any exposed meat. If you have time, let the meat rest to let the marinade penetrate into the meat, as long as overnight—but even a hour will do. Enter your email address below and you'll receive new posts in your inbox as soon as they're published, at absolutely no charge. You'll never miss another recipe! This would warm up my Minnesota kitchen in no time! We used to be able to get pork shanks at the Farmer’s Market – now pretty much closed for the winter. Some butchers brave the cold. I just love the idea of pork and potatoes – time for some hearty fare! If you search for a REAL butcher in the US – one who raises and/or cuts up the whole animal, you can get shanks, but alas, these days these butchers are hard to find. On top of that, sometimes the few butchers that do have them, smoke them. When I lived on the East coast, I found one such butcher in PA near Philadelphia. Now I live in Arizona, and the University of Arizona here has a ‘meat science’ curriculum – they have their own farms, and teach real butchering. They have a store open to the public to sell the meat. Fresh shanks are still a special order there, they usually use the meat for sausage, etc ! Since I returned from Italia, my quest for shanks has been so intense, that I carry a picture of a cooked one in my wallet showing the bones! If you live in an area with Mexican ‘carnicerias’, they sometimes will have shanks, called ‘chamorros’ in Spanish. Evidently ‘chamorro de puerco pibil’ is a popular recipe. When I lived in Italia, my in-laws were active in their local Festa della Unita’ in Piemonte and one of the most popular dishes there was Stinco con Polenta – a pretty hearty dish for August! BTW, I think you missed a key ingredient in your recipe – most of the Italian recipes I’ve found call for juniper berries in the marinade/rub. I pound them on a mortar with whole black peppercorns, rosemary, thyme and sage and oil to make a paste, then marinate it overnight. Forza! Keep searching, you will find them. Thanks for the tip. No Mexican butchers around here that I know of, but we do have Central American markets. Worth a try! I am salivating just looking at this dish! Pork hock and trotters are some of my favorite cuts of pork and I just think there’s something special about that collagen-rich skin and tender meat. Love this recipe, it makes a perfect one pot meal. Will have to cook it myself soon. Thanks! That is a great looking dish and worth the effort of trying to find pork shanks. My husband had something very similar a few years ago when we were staying in Ortisei in Val Gardena in the Italian Dolomites. Thanks for sharing your recipe. Wow, John. You’re *really* lucky to have a grocery like that close by. Do try it and let us know what you think. Delicious recipe Frank! We do have pork shanks sold here in Greece, so in this case do we still boil them (eg for an hour) before roasting them? Thank you for another yummy idea! So very true how you can’t find the right cut but there is an Italian butcher sort of near me I will visit and ask! A lovely and comforting meal for a cold winter’s evening (and those potatoes!!). Let us know if you have any luck, Lora! I’ve had stinco in Italy, but never prepared it here Frank. Why is it so difficult to get the right cut here? Your hocks are a nice substitute. I ask myself the same question! It seems most shank winds up getting used for ground pork, otherwise it’s old as part of the “picnic shoulder”, which may just be too big a cut for most consumers. This is a really neat recipe. You’re right — it’s been ages since I’ve seen pork shanks. And usually the hocks are smoked, although I can find fresh ones at some markets. We’re about to get some really cold weather, so this is perfect. Thanks! Hope you try the recipe, John. Definitely a winner. Those potatoes are just awesome!!! Che bella! I have to see if our butcher can provide the unsmoked ham hocks. I can tell this will be a favorite! Do let us know, David, if you try them. Curious to get your reaction. Brings back lovely memories of a dinner in the cantina of our friends who live at the base of the Dolomites in Trentino. The hocks are a wonderful adaptation, it seems as though I am frequently instructing my butcher on cuts of meat to recreate dishes from Italy. Sitting in front of a fire on a snowy winter’s evening – ottimo. Thank you for the memories this dish brings, I remember having something like this in nothern Italy. My husband loves pork hocks when visiting Germany. I’m going to look for shanks , we have a good butcher in town. Thank You Frank, Roast Pork is one of my favorites I too have never seen Port Shank/Shin at the Butcher. For those in the US a Pork Shoulder Roast might do the trick, no bone, but the cut is just above the shank and is very flavorful. Cheers and Merry Christmas! Thanks, Jeff! I think you may be on to something there. I did a little further research and found that one of the primal cuts of pork, the “picnic shoulder”, includes the shank of the front leg. Apparently usually used for ground pork, which I guess is why we don’t often see it in stores. But I’ll be looking out for it… Merry Christmas to you and yours as well! As Chiara said above — this would be a dish my mamma and papà would treasure. I wish they were still with me, I’d love to cook this for them. When we first moved to the states they really missed their traditional food. It was quite an adjustment — no Italian community where we were. I will be saving this recipe and making it when I looking for a great Italian comfort food. Buona giornata! So glad I could bring back those memories, Marisa Franca. It’s a dish worthing giving a try, I think, Hope you like it. … beautiful dish! and yes, how I miss the stinco from ANY decent butcher/supermarket. I have also tried the already cooked one (like cotechino) and it was not bad at all. Here in the UK shin of pork can be found without major headaches. I totally agree, Stefano. It’s a fascinating cuisine which reminds me so much of the foods that I encountered when I lived in Vienna but—at the risk of offending my Austrian friends—better. The best Knödel/canederli I’ve ever had was in Bolzano, for example. E’ un piatto delizioso della tradizione triestina , infatti la Mitteleuropa ha influenzato tantissimo la nostra cucina,è perfetto in questo periodo dell’anno ! Buon weekend Frank, un abbraccio ! Un altro motivo per visitare Trieste… Buon weekend anche a te, Chiara! We don't monetize this blog in any way, but it does cost us money to maintain it. If you want to help us out to cover those costs with a small totally voluntary contribution, you'd be our BBF! All posts and other material contained on this website is, unless otherwise stated, the property of Frank A. Fariello, Jr. Copyright and other intellectual property laws protect these materials. Reproduction or retransmission of the materials, in whole or in part, in any manner, except for non-commercial, personal use, without the prior written consent of the copyright holder, is a violation of copyright law. Requests for permission to reproduce or distribute materials available on this website should be directed to gnocchiaifunghi@gmail.com. Lawyer by day, cook by night.